Arkhip Mikhailovich Lyul'ka (23.03.1908, Savarka, Bohuslav district, Kyiv region — 01.06.1984, Moscow) – a Soviet scientist and designer of jet engines of Ukrainian origin. Member of the USSR Academy of Sciences (since 1960), Hero of Socialist Labor (1957), winner of the Lenin Award (1976), winner of the State Stalin Prize (1948, 1951). Graduated from Kiev Polytechnic Institute in 1931. 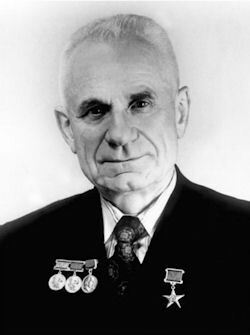 A.M.Lyulka was the first to initiate designing jet engines in the USSR. With a team he worked on the project of a turbojet engine and succeeded in creating it. In 1941 Lyulka was the first worldwide to introduce the turbofan scheme, which became the basis of all modern turbojet engines. In 1947 the first Soviet turbojet planes were equipped with turbojet engines, developed by Lyulka’s OKB. The USSR became the third country in the world (after England and Germany) to create their own turbojet engines. Under his supervision, Lyulka’s OKB developed dozens of types of turbojet engines, marked ‘AL’. Planes, equipped with AL engines set more than 50 world records. The modified model of the Saturn AL-31, the development of which began in 1973, still remains the best engine for highly maneuvering fighter aircrafts. After the revolution, he entered primary school, later transformed into a seven-year school. After the seven-year period - a vocational school in Belaya Tserkov. His first failure to enter the Kiev Polytechnic Institute did not discourage the young man. He stubbornly continued to prepare for admission to university. Of the 150 people who took the exam, only 20 people were taken and among them he, Arkhip Lyulka. After graduating from the Kiev Polytechnic Institute, a young engineer was sent to the graduate school of the Research Institute of Industrial Energy in Kharkov. The prospect of development of aircraft engines, many very venerable scientists of the 30s saw steam-turbine power plants. The young specialist who came to the department of engines of the Kharkov Aviation Institute in 1933, took the liberty to say: this direction is unpromising. The steam turbine engine is not suitable for aviation. The future of aviation is very high flight speeds, and neither piston nor steam-turbine engine can give them. Only the engine of tomorrow — jet, which is absent today, can give the aircraft super speed. But he, a young engineer, Arkhip Lyulka, undertakes to create it. March 23, 2008 saw the centenary of Arkhip Mikhailovich Lyulka's birth. Academician A.Lyulka was an outstanding scientist and aircraft engines designer, organizer and discoverer. His biography is a part of the aero-engines and contemporary aviation history. Lyulka is internationally known as a creator of engines for combat aircraft. The Russian Air Force and dozens of foreign armies are currently equipped with the so-called "AL" air-engines with "AL-31" becoming last century's truly best-seller. While Moscow has a square and a plant named after the Russian renowned constructor, the international aviation community announced 2008 as a Year of Arkhip Lyulka. The Aviation Society announced 2008 the year of Arkhip Lyulka. Arkhip Lyulka was one of the founders of the NPO Saturn design school and the national engine-building industry as a whole. His life was an essential period of the Russian turbojet engines history, and his creative work as an engine designer has become the property the mankind. That is why the centenary of academician A. Lyulka's birth was celebrated by the scientific community of the world. "We will always have to remember that thanks to Arkhip Lyulka's efforts and to the efforts of his colleagues the great engines of the AL brand have been created; these engines have been manufactured and are still manufactured now in thousand pieces and equip the Air Force of Russia and armies of dozens of other countries around the world. The AL-31 engine has beyond doubt become the technical bestseller of the 21st century. Today we are celebrating the centenary of Arkhip Lyulka's birth, and at this very time thousands of engines created by him raise hundreds of aircraft of such world countries as Russia, India, and China to the skies every day. Nevertheless, Lyulka managed to get through to the People's Commissar of the aviation industry and defend his project. He was appointed technical manager of the RD project. In the pre-war years, SKB-1 completed the detailed design of a RD-1 jet engine with a thrust of 530 kgf. From 1933 to 1939, Arkhip Mikhailovich taught at the Kharkov Aviation Institute and dealt with the problem of using gas turbines in aircraft power plants. In 1939, Arkhip Mikhailovich was transferred from Kharkov to Leningrad to the Kirov Plant, and a small design bureau was established on its territory. There, the reactants built and tested a bench copy of the RD-1 engine. All halted the outbreak of war. She scattered the team of creators of the first domestic jet engine in different cities of the Urals. But already in 1943, when it became known about the creation in Germany of airplanes with jet engines, Moscow issued an order to find all the developers of advanced topics in aviation. One of the first people they were looking for was Arkhip Lyulka. Arkhip Mikhailovich boldly proved the advantage of the new engine at a meeting in the aircraft commissariat in February 1944 and receives permission to resume work. In March 1944, the TR-1 engine began to be prepared for production. Already in 1945, the first domestic turbojet engine with a thrust of 1250 kgf stood at the stand. For the construction of the flight version of the turbojet engine was allocated a pilot plant. At the end of February 1947, the TR-1 passed state tests , and on March 3, 1947 a government telegram came, signed by I. Stalin: the chief designer and the whole team received congratulations on the successful completion of state tests and the creation of the first Russian jet engine. The first flight of the aircraft with the first turbojet engine is scheduled for May 28, 1947. At the airfield in Zhukovsky, Pavel Sukhoi, the chief designer of the Su-11, and Arkhip Lyulka, the main engine designer. In the cockpit - test pilot George Shiyanov. TR-1 engines were running. Inspirational, but very hard work on new engines continued. In subsequent years, in the design bureau A.M. The cradles were created: engines TR-2, TR-3, AL-5. In the mid-50s, the AL-7 and its afterburner modifications were created: the AL-7F, AL-7F-1 and AL-7F-2, which were installed on the IL-54, Tu-110, La-250, Su-7B aircraft , Su-9, Su-11, Tu-128 and M-10 seaplane. In the years 1965-1970 a turbojet AL-21F was created, the modification of which the AL-21F-3 went into high-volume production. The engine has been manufactured so far and has been successfully operated on aircraft of the Su-17M, Su-20 and Su-24 types both in Russia and in some foreign countries. “Arkhip Mikhailovich took special care of the work of the testers, took to heart all the luck and failures of the tests, he simply“ lived by the machine,” recalled Hero of the Soviet Union, Honored Test Pilot Major General Vladimir Sergeevich Ilyushin. "He always listened carefully and quickly responded to them. The remarkable Su planes are the result of the joint creative work of the Design Bureau of General Designers P.O. Sukhoi and A.M.Lyulka and vision for the future development of aviation, I think that the PO Sukhoi aircraft with engines of A.M.Lyulka - the best in the world. " In 1978, on the occasion of his 70th anniversary A. Lyulka addressed the collective of the Saturn design bureau created and headed by him: "We are now called the pioneers of the Russian turbojet engine creation. This is a pleasing definition and it is binding upon us. There is something from youth in it, which cannot be forgotten. The design bureau, its remarkable people have passed a long and not easy way from the first experiments and design studies in the turbojet engines technology up to complete turbojet engines approval as the main powerplant for the contemporary aircraft of any type and application. This was the era of enthusiasts who had taken a completely independent way. Many years have passed since the work on the turbojet engines in the Soviet Union began, but in the years to come a number of very interesting and complex tasks remain in creating new generations of engines". The country duly appraised the designer's merits: in 1975 he was awarded a rank of the Hero of the Socialist Labor, and he was awarded the orders and medals of the USSR; he became the Lenin and the State prize winner (twice). Arkhip Mikhailovich died on June 1, 1984 in Moscow and was buried at the Novodevichy Cemetery. After A. Lyulka's death, his name was given to the company he had been in charge of since 1946. The square in Moscow near the A. Lyulka's design bureau and the pilot plant was also given the name of Academician Lyulka. Saturn Research and Production Association was named after him. NPO Saturn Technical Director-General Designer Mikhail Kuzmenko, who had headed the design bureau since 2000, said: "The role of personalities and pioneers, such as Arkhip Lyulka, was of utmost importance. This was because the business of any designer was dangerous, accompanied with a good deal of difficulties; it's a highly responsible business. You should have enough courage to follow the path of an explorer, experience numerous troubles, sacrifice, and, nevertheless, move forward. To my mind, the innovator's role was like this. And this was the path followed by A. Lyulka, who created his own school of design". What are the peculiar features of the A. Lyulka's design school? About a quarter of the century has already passed since A.Lyulka's death, but everything he made and created has not lost its actuality and was still implemented today. There are other cases. For example, there was a great engineer, a scientist, a specialist, and there was a company. The scientist died, and his company stopped its existence, and his school of design broke. It does not exist any more. In the case of A. Lyulka the situation was different. The school has been formed during dozens of years. Concurrently numerous engines have been designed. Those were the years of designer A. Lyulka creative work. It turned out so that the conjunction of a man and a machine, experience of the people and experience concentrated in the finished product helped to create the school. It has been proven by life that A. Lyulka's school turned out to be viable, even during the hard times of the 1990s. When the government stopped supporting the company, which had been established and headed by A. Lyulka for a long time, the company had to suffer quite a lot of difficulties. However, in spite of the heavy conditions A. Lyulka's design school managed to preserve the most important thing - the basis of the collective and the basis of knowledge possessed by the collective. The time showed that the engines designed by Arkhip Lyulka turned out to be not only foremost but also advanced as far as their further development was concerned.